If you’re majoring in Psychology, you’re likely aware that you will be making less once you graduate than someone who majored in Computer Science. But you might not be aware of how much more difficult it will be for you to repay your student loans than it will be for that Computer Science graduate. Thankfully, The Hamilton Project has created the Undergraduate Student Loan Calculator to help students understand how difficult it will be for them to repay their student loans based on their majors. This calculator is an important tool that helps students visualize how their likely future income impacts the level of difficulty involved in repaying their loans. This information will hopefully help students choose majors that will provide a better return on investment or encourage them to incur less student loan debt. In this article, we use an average student loan debt of $35,000 for each student and look at a number of different majors to see how easy or difficult it will be for graduates with those majors to repay their student loans. We do this by using the average pre-tax salaries of graduates during their first ten years after graduation as compiled by The Hamilton Project. We also use The Hamilton Project’s criteria that if 0-10% of your income is going towards your student loans that means that paying back your student loans will be easy, if 10%-12% of your income is going towards your loans that repayment will be difficult, and if more than 12% of your income is going towards your loans then repayment will be incredibly difficult. We also assume that students have 10 year repayment plans and are paying the current federal student loan interest rate of 3.76% on their loans. The difficulty of repaying student loans across all majors spikes in the first year after graduation where students are paying over 18.9% of their monthly salary towards their student loans. Repayment continues to be very difficult in the second and third year after graduation when they are paying 14.4% and 12.4% of their incomes towards their student loans. Their loan repayment only begins to get easier in year 4 through 6 when they pay between 10% and 12% of their salaries towards their loans and gets even easier in the last four years of their loans when they are paying between 9.7% and 8.5% of their salaries towards their loans. Unsurprisingly, Computer Science majors have a relatively easy time repaying their student loans. In fact, they only face difficulty making payments in their first two years when they are paying 12.6% and 10.3% of their incomes towards their loans. During the final eight years of their loans, they are paying between 9% and 6.3% of their incomes towards their loans. Similarly, Finance majors don’t have much difficulty repaying their loans. In the first two years, they pay between 12.6% and 10.5% of their incomes towards their loans, but, during the final eight years, they only pay between 9.2% and 6.6% of their income towards their loans. Fine Arts majors face difficulty repaying their loans throughout the entire ten years of their repayment. This difficulty spikes in the first three years when they will be paying 33.5% to 19.4% of their incomes towards their student loans. The only year in which they aren’t facing extreme difficulty is in their tenth year when their student loans payments make up 11.7% of their incomes. Given these numbers, Fine Arts majors would likely not be able to pay back their loans in 10 years or would have to sign up for income based repayment plans or longer repayment terms. Engineering majors don’t have any significant difficulties repaying their student loans according to the calculator. In their first year of repayment, they must pay 10.2% of their salary towards their student loans but after that the percentage ranges from 8.5% to 6%. Nursing majors have some difficulty repaying their loans in their first year of repayment as they must pay 10.5% of their income towards their loans. After that, they pay between 9.4% and 7.9% of their income towards their loans. Biology majors face some difficulty paying back their loans during the first four years of their repayment as they must put 20.9% to 12.5% of their income towards their loans. During the fifth to seventh year of repayment they also experience moderate difficulty repaying their loans and contribute 11.4% to 10% of their income. But in the eighth to tenth year, they pay only 9.7% to 9.3% of their incomes towards their loans. Physics majors earn more than Biology majors so they don’t face the same difficulties in repaying their loans. Physics majors must put 13.9% and 13.4% of their salaries towards their loans in their first and second years and 10.9% towards their loans in their third year of repayment. After that, they pay between 9.9% and 7% of their salaries towards their loans. Psychology majors face extreme difficulty repaying their loans for the first six years and moderate difficulty repaying their loans after that. In the first six years, they pay between 22.3% and 12.5% of their incomes towards their loans and in the last four years they pay between 11.8% and 10.3% of their income towards their loans. Students who graduate with English majors face extreme difficulty repaying their loans during the first six years, moderate difficulty during the next three years and an easy time repaying their loans in the final year. In the first six years, the percentage of their income that they pay towards their loans varies between 22.6% and 12.5%. In the next three years, this percentage varies between 11.8% and 10.4%, and in the final year they pay 9.6% of their income towards their loans. Is Your Major Not Here? If your major isn’t here, you can go find out information about how hard it will be for you to repay your loans using The Hamilton Project’s Undergraduate Student Loan Calculator. You can input your major and the details specific to your student loans to see how large a percentage of your future income you might be paying towards your student loans. Just be careful since while The Hamilton Project suggests that paying 10% of your salary towards your loans is ‘easy,’ other experts recommend you limit it to just 8%. 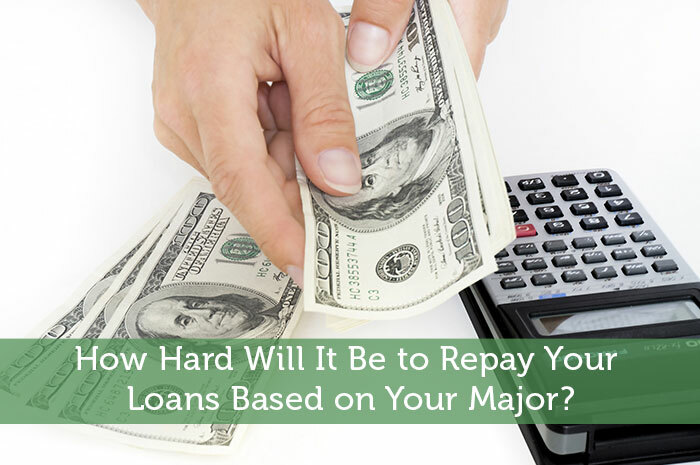 How Hard Will It Be to Repay Your Loans Based on Your Major? Our problem is slightly different here in the UK. Over here we have far too many people paying thousands for a degree there are not jobs for. They end up in jobs paying far less than they were expecting an inevitably spend a life in debt because they do not earn enough to pay it back, or they go slightly over the earning threshold and struggle with the repayments!